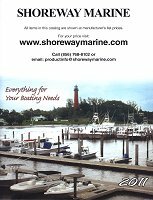 Shop Shoreway Marine: Magma Marine Kettle 2 - Original Size 15"
Magma Marine Kettle 2 - Original Size 15"
The Marine Kettle 2 incorporates new features that are both useful and friendly -- including being virtually windproof. It's dependability in a stiff breeze is due to a virtual blow-out proof turbo venturi and valve system. A front mounted piezo igniter is now included, as well as a new patented burner and heat distribution system that reduces flare-ups. The burner also adds years of life to the grill by directing more heat to the cooking surface. Full, double lined inner safety shell to keep the outside of the grill cooler. A mirror polished, 18-9 marine-grade stainless exterior finish provides superior corrossion resistance. Topping off the Kettle 2 is a polished, stainless "Stay Cool" handle. The hinged lid is balanced so it won't slam shut as the boat rolls. 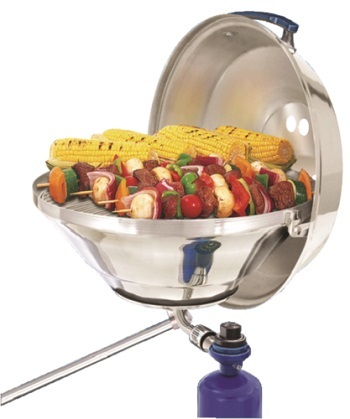 Magma's patented plate and dome system make it the only boat grill that is truly a grill, stove or oven. The grill features a new cast stainless indexing bracket and clamp to provide easier, more positive level mounting. Uses standard, disposable 1lb propane canister or will easily adapt to the boat's existing onboard LPG (propane) or CNG (natural gas) system. Newly designed valve system adjusts left, right, inboard or outboard for easy heat control access and fuel bottle change.